Martha Berry Digital Archive | Letter from a donater, thanking Martha Berry for cotton, as well as a donation to the school. Letter from a donater, thanking Martha Berry for cotton, as well as a donation to the school. In this letter, a person (handwriting) thanks Martha Berry for the cotton that she sent at Christmas time. This person then encloses a donation of $100 for one of the boys. 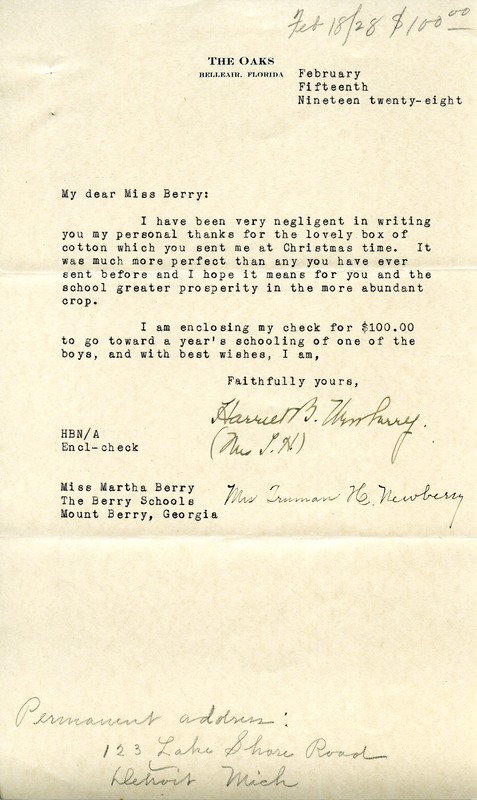 “Letter from a donater, thanking Martha Berry for cotton, as well as a donation to the school..” Martha Berry Digital Archive. Eds. Schlitz, Stephanie A., Kyle Dodrill, et al. Mount Berry: Berry College, 2012. accessed April 22, 2019, https://mbda.berry.edu/items/show/8566.